U.S. Flag Store's North Carolina State Flag is printed in America on Nylon flag fabric. Since this flag is made in America, U.S. Flag Store is able to ensure that the complex State emblems are printed with accuracy, sharp detail and bright colors. This outdoor North Carolina State Flag is finished with the same high quality materials as all of U.S. Flag Store's US flags, and is extremely durable and long lasting. Design: A flag with two equally sized horizontal stripes and one vertical stripe on the left side of the flag. The top horizontal stripe is red and the bottom one is white. The vertical stripe is blue and contains the letters "N" and "C" separated by a white five-point star. The blue stripe also includes two banners, one placed above and one placed below the letters and star. One banner reads "May 20th 1775" and the other reads "April 12th 1776". Meaning: The colors red, white, and blue are used because they are the national colors of the United States of America. The letters "N" and "C" stand for North Carolina, and the star signifies North Carolina's statehood and its place as one of the stars on the American Flag. The date May 20th, 1775 is the date of the Mecklenburg Declaration of Independence. April 12th, 1775, is the date of the Halifax Resolves. Before the Civil War, the state of North Caroline never officially adopted a state flag. Troops and regiments from North Carolina typically carried blue flags with the state seal placed in the center, but none of those were considered official state flags. On the same day that North Carolina seceded from the union, in 1861, Colonel John D. Whitford presented an ordinance to adopt a flag. An official flag committee was formed and after some deliberation they stated that, "...the flag of this State shall be a blue field with a white V thereon, and a star, encircling which shall be the words, "Sirgit Astrum, May 20, 1775." However, the design that the committee described never came to fruition. Instead, Colonel Whitford and the committee consulted an artist named William Garl Browne and he presented a design for their approval. Browne's design was very different from the committee's original design, but it was still approved by the North Carolina Convention on June 22nd, 1861. All throughout the Civil War, this flag and the Confederate battle flag were carried by North Carolina regiments. After the war ended and North Carolina rejoined the Union, the state adopted a new design for their state flag to accompany their new start as a member of the United States of America. 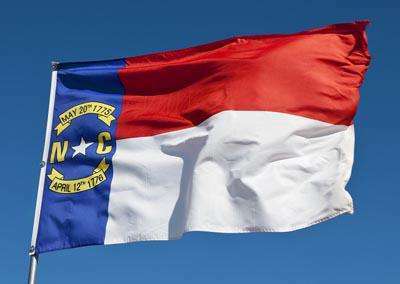 In 18815, a bill was introduced by General Johnstone Jones to officially adopt the new design of the North Carolina state flag. The new flag swapped the areas that were red and blue, added the letters "N" and "C" on either side of the star, and changed the date of North Carolina's secession (May 20th, 1861) to the date of the "Halifax Resolves" (April 12th, 1776). This is the last time that the North Carolina state flag was changed, and is still the official design of the state's flag today.